When Kenny and I decided to call it a night on Friday, we were still on the Little St. Bernard pass. As we started our descent from the top of the pass we pulled in to a hotel that our friend Ed mentioned he was going to try to stay at. We were hoping to see Ed’s copper V-Strom parked out front. Instead, we found 2 dozen other bikes. All those bikes were surely a good sign about the place, right? Though their route initially put them in front of us, somehow we’d gotten ahead of Ed and Drea. When we landed in Milan (the four of us on the same flight) we split up – Kenny and I went to Stresa, Italy to fall asleep next to the lake and Ed and Drea set off for Zermatt, Switzerland to take a peek at the Matterhorn. Our plan was to do our own thing on Thursday and Friday and then all come together on Saturday morning. The last part of the puzzle would be meeting Pimmie in Susa, Italy. Pim, coming down from the Netherlands, was the last member of our group to rendezvous with for a week of riding. 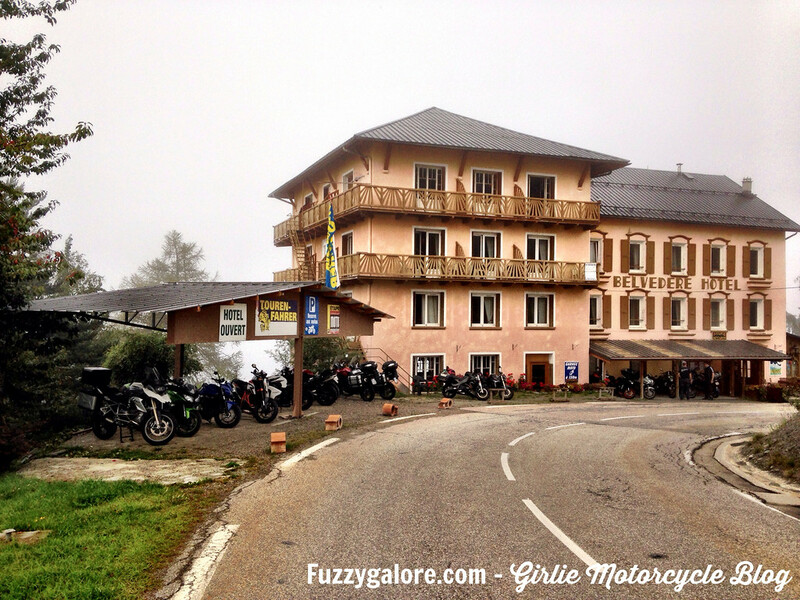 The Belvedere Hotel really catered to the motorcyclist. 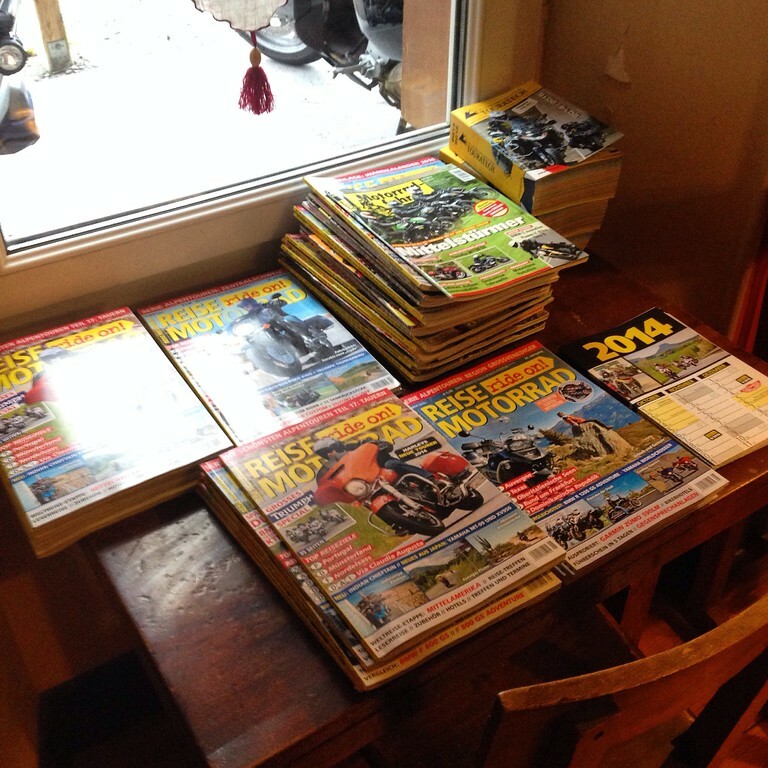 In their lounge they had motorcycle magazines and postcards, maps of good riding in the area. 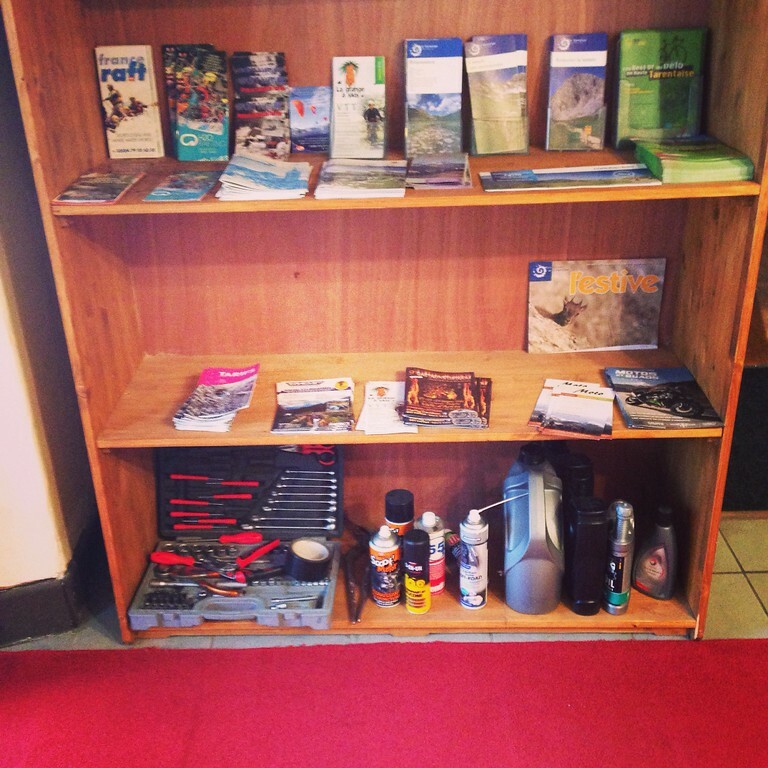 They had covered motorcycle parking and even made tools and cleaning supplies available in the entryway! 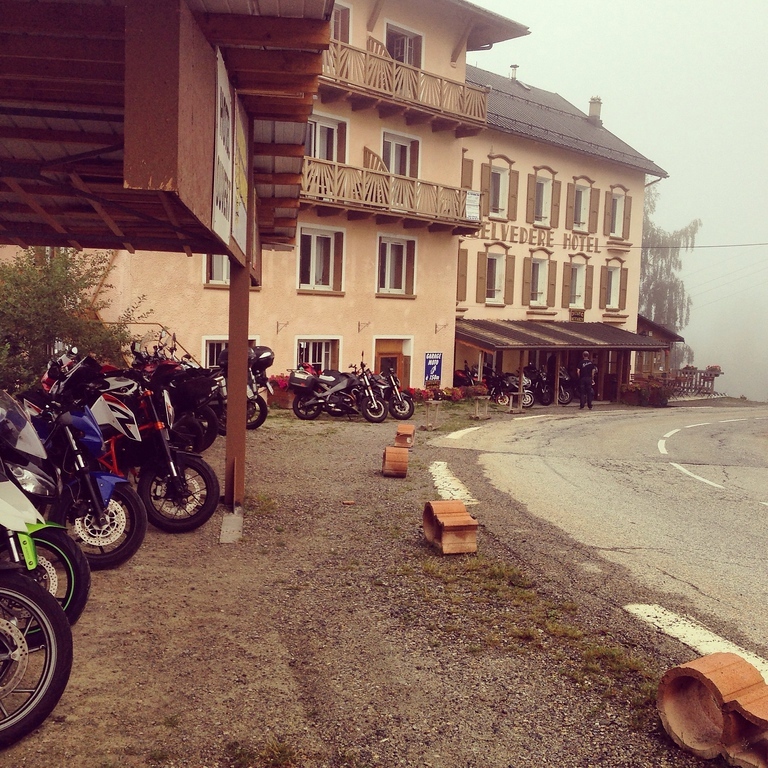 Motorcycle culture is quite different in Europe. 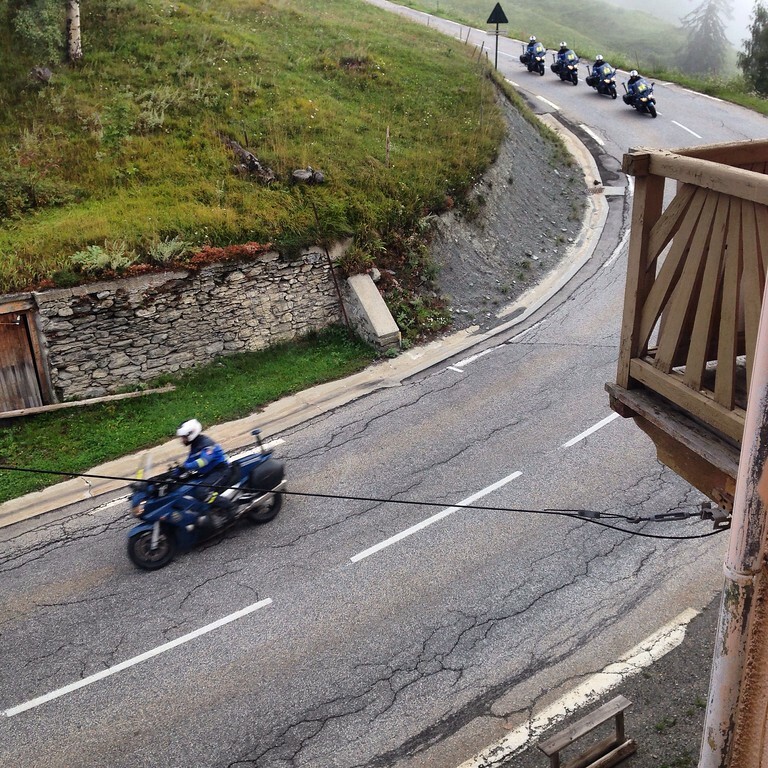 Being right on a corner of the pass, you got to see bikes whizzing by all the time. After jettisoning our riding gear and having a shower, Kenny and I went down to the dining room. We sat there in the warm light sipping beers feeling that “travel high” that you sometimes get when you realize just how fortunate you are to just float in the world. There is a period at the beginning of a trip when you feel like you have all the time in the world and you are free. We were there. Torn between the want to stay up and shovel more delicious home-cooked regional dishes into our faces and the still nagging jet lag, we retired early to bed. We were fat, happy and excited to regroup with our friends in the morning. Awoken by an unfamiliar discordant sound, I went from dead asleep to sitting up bolt straight in bed, heart thumping in my chest. What the…?! Through our open window came the peculiar, discordant tones of… howling. When you’re dwelling in that hazy space between sleep and wakefulness, that is a sound that is quite unsettling. That’s the state where anything that your imagination conjures up is reasonable and it’s usually f’n scary. In the dark of our room, I turned and looked out the window but saw nothing. Everything beyond the reach of the lone street lamp was obscured by the envelope of blackness. Perhaps it was best that I didn’t see what was obviously a werewolf out there. I firmly believe that one of the less tapped into portions of our brains allows a spouse to actually hear eye rolling and the inner monologue of their partner. I have harnessed this ability. Because my brave protector’s inner monologue had time for sarcasm, I decided it was safe to go back to sleep. The Belvedere was a great place to stop for the night. I would absolutely stay there again. It’s rooms were on the petite side but the beds were comfortable, the rooms were clean, the food was good and the atmosphere was lovely. And… they have werewolves. But for some reason they don’t mention that on the website. Werewolves?! Are you kidding, I’d love that place!! One thing I find interesting is how in Europe, the moto police always wear ATGATT, yet here in the States it’s less important. At least in NJ anyway. I always wondered if those top-of-the-pass hotels would be any good. Small rooms are okay with me, especially in old buildings. 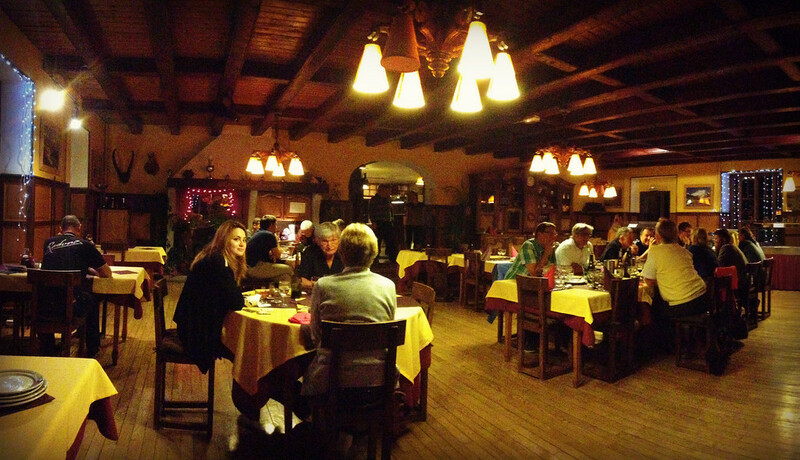 I can just imagine sitting there at dinner with you, enjoying that lovely early-vacation glow of things still to come. Damn! From that first pic, it certainly looks like werewolf country. Though it’s France, that could be the scene-of-the-incident for any number of nightmarish characters: the Hound of The Baskervilles; the one and only Dracula; or even good, old Jack The Ripper. Spooky-cool. “Eye roll hearing” superpower. Just one of many?